Burkina Faso – Ghana – Once you are in the semi-finals of the African Cup of Nations eliminated from Egypt, or Cameroon, the selection of Burkina Faso and Ghana will on Saturday night strength in the consolation match for the third place. Otherwise, Burkina Faso and this time missed the opportunity for the first time in its history reaches the title of African champions, while Ghana’s done more in four occasions, and in addition to this competition came as the current vice-champions of Africa. Let us add that these two selection last met four years ago, in the semi-finals of the African Nations Cup, where Burkina Faso won only after a penalty, while before that Ghana twice in a row was better, and this is the first in the World Cup and then the African Cup of Nations. Although hardly anyone gave any serious chance in this tournament, teams of Burkina Faso is the umpteenth time showed their quality and only a lack of luck cost loans in the grand final. In fact, they are in the semi-final with the view favored Egypt 90 minutes finished with 1: 1, and as later in extra time there was no goal was followed by a penalty shoot-outs, where they then Egyptians still were somewhat saner and celebrated with total 5: 4. 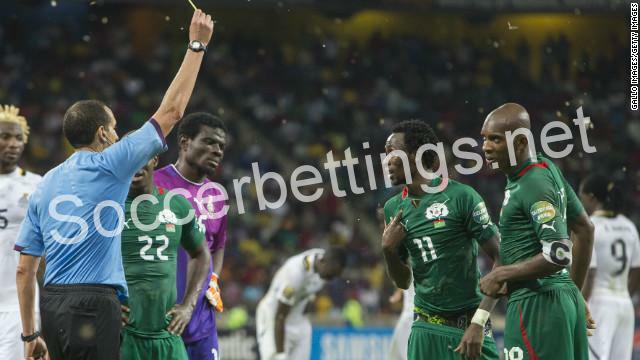 However, Burkina Faso after three series even had an advantage, but then blundered goalkeeper and striker Koffi B. Traore, while on the other hand of the Egyptians in the last two series sure Salah and Ward. What we also need to emphasize the fact that Burkina Faso, with the finalists Egypt and Cameroon, and in fact the only selection that is not defeated in this tournament in 90 minutes, considering that previously played in the group stage draw (1: 1) against Cameroon and hosts Gabon and win over Guinea-Bissau with 2: 0, and after that the same results in the quarter were better than Tunisia. Otherwise, the coach of Burkina Faso, Duarte, any of the previous five games is not played with the same composition but because of that and now against Ghana, we expect some changes, especially since the injury in question occurs wing attacker Pitroipa and ongo. 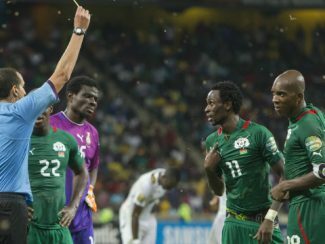 As for the still current African vice-champions, they were in the semi-final against Cameroon well held only until 72 minutes, but after that time the network goalkeeper Razak shook Ngadjui, chosen coach Grant had to play a lot more risky and it backfired on them in judicial compensation when they received another hit. In this way, the Ghana once again missed an opportunity to reach their fifth title of African champions, the team that last won back in 1982, so it is for them all this has become more and frustrating, especially since the recent history of losing even three finals in the African Nations Cup. Otherwise, Ghana previously in the quarter-finals with 2: 1 was better than the selection of the DRC, while in the group stage after the victory of 1: 0 of Uganda and Mali, in the decisive match for first place in the group lost with 1: 0 of Egypt. This actually means that they are in this tournament and defeated only by the finalists, so that side we can point to and did not deserve anything more than this fight for a consolation bronze medal. However, that would come to it must be displayed in a much better light than in the semi-finals, especially in attack, so that’s why this time and we expect something more offensive profile coach Grant. Burkina Faso is in all five matches in this tournament achieved at least one goal and therefore we believe that it can do the same and in the match for the third place, especially since it will be the selection of Ghana is likely to present the release of more aggressive than usual.